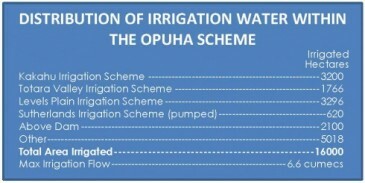 The Opuha scheme operates by releasing water into the Opuha River which flows into the Opihi River. Irrigation takes are from both the Opuha and Opihi rivers. 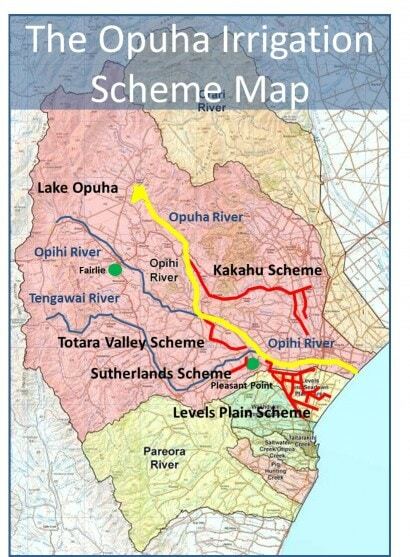 Irrigation water is supplied to a number of sub-schemes (Levels Plain, Kakahu, Totara Valley, Sutherlands) off these rivers which distributes the water through distribution races and channels. The water is pumped from these races and channels by the land owners. Other irrigators pump from the river either through galleries or adjacent bores. There is less than 2% of the irrigated area remaining in borderdyke irrigation. Water is also supplied to the Timaru District Council for commercial and domestic purposes. Irrigators determine their irrigation requirements and order their water on a daily basis. These water orders are aggregated and sufficient water is released from the dam to supply the irrigation requirements as well as ensuring the minimum flow is maintained in the river. Opuha Water has its own management and administration structure and personnel, and has contracted out the maintenance operation of the Power Station and river control gate to TrustPower. TrustPower have their Operation Centre in Tauranga and maintenance support from their base at Lake Coleridge.